Hoot for Kids is a monthly toy and activity treasure box for kids aged newborn to 6 years. Toys and activities are tailored to your child’s developmental stage. 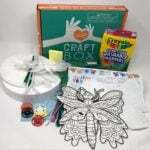 Hoot for Kids is a box that will vary based on the recipient. When you sign up you will fill out a questionnaire about your child. 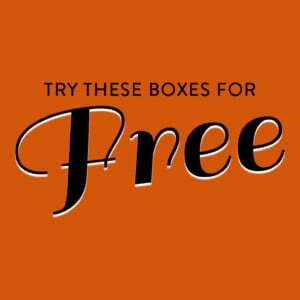 Based on your child’s age and gender (or choice of a neutral box), your box will be very personalized. Therefore your box may look very different from mine. This review is of the $34.99 + shipping monthly box, customized for a 3-year-old girl. 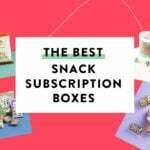 Check out all of our HOOT for Kids reviews and more educational and kid activities boxes in the Kids Subscription Box Directory! Each item in the box was listed along with some information about the benefits of the toy and what areas they might help strengthen such as creative play, fine motor skills, etc. The activity card gave helpful tips on building my daughter’s independence and organization. This modeling dough is made of flour, salt, cream of tartar and oils. The package came with two four ounce jars of yellow and orange dough. It’s made in the USA and is pliable and lightly scented with rosemary. We love Petit Collage items; we’ve always found them to be high quality with a beautiful aesthetic. This adorable storytime themed puzzle features a bear, tiger, and owl in a library surrounded by books. The tin has a slit in the cap, allowing it to double as a coin a bank when your child has outgrown the puzzle (or if you’d just like to store the pieces in another container). My daughter loves puzzles and was thrilled when she saw this bear. My three-year-old daughter isn’t able to do a jump rope yet, but this will be a great outdoor toy to have on hand when she’s a bit older and more coordinated. Yay, another item by Petit Collage! This pop out and color castle is a bit advanced for my daughter right now so I have set it aside for when she’s a bit older. I don’t want to complete the craft for her as I think most of the fun lies in the construction itself. The kit came with pop-out pieces that slide together, stickers for decorating and colored pencils to color it all in. Verdict: We enjoyed our second Hoot for Kids box, though this month I found a couple items felt like they were a bit out of reach for my daughter’s age and developmental levels. The total value of the box was $42 which is over the $34.99 cost of the box but didn’t fully cover the shipping ($15 to NJ) so that was a little disappointing this month. I think adding more items would have helped boost the value and made it feel like more of a deal. 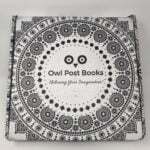 Hoot for Kids can be ordered as a one-off box and would make a great gift, or it can also be a monthly subscription. What do you think of Hoot for Kids? It’s definitely not Citrus Lane (gosh I miss that box) but it does fill that void for a fun kid/toy box. I love that this box is not filled with blind bags and key chains, but real high quality toys that will last.